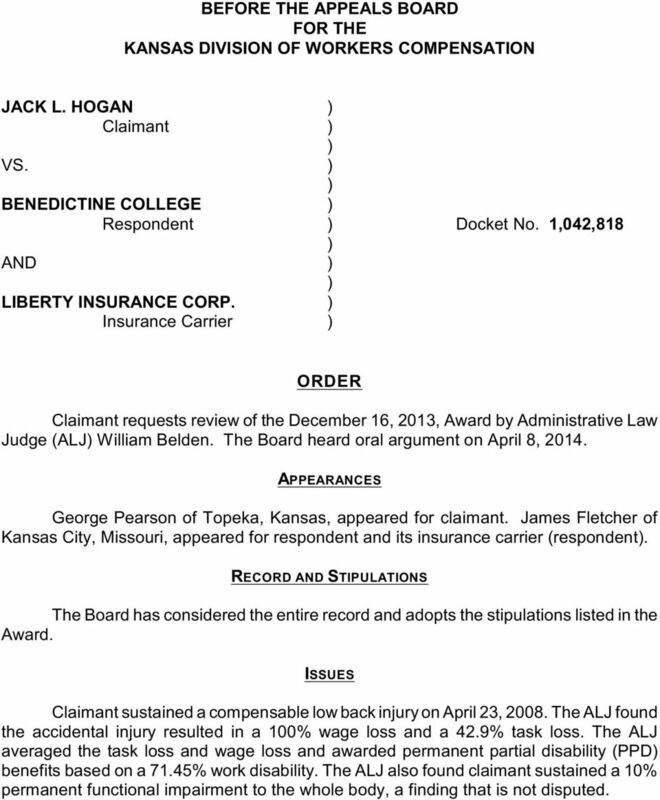 1 BEFORE THE APPEALS BOARD FOR THE KANSAS DIVISION OF WORKERS COMPENSATION JACK L. HOGAN ) Claimant ) ) VS. ) ) BENEDICTINE COLLEGE ) Respondent ) Docket No. 1,042,818 ) AND ) ) LIBERTY INSURANCE CORP. ) Insurance Carrier ) ORDER Claimant requests review of the December 16, 2013, Award by Administrative Law Judge (ALJ) William Belden. The Board heard oral argument on April 8, APPEARANCES George Pearson of Topeka, Kansas, appeared for claimant. James Fletcher of Kansas City, Missouri, appeared for respondent and its insurance carrier (respondent). RECORD AND STIPULATIONS The Board has considered the entire record and adopts the stipulations listed in the Award. ISSUES Claimant sustained a compensable low back injury on April 23, The ALJ found the accidental injury resulted in a 100% wage loss and a 42.9% task loss. 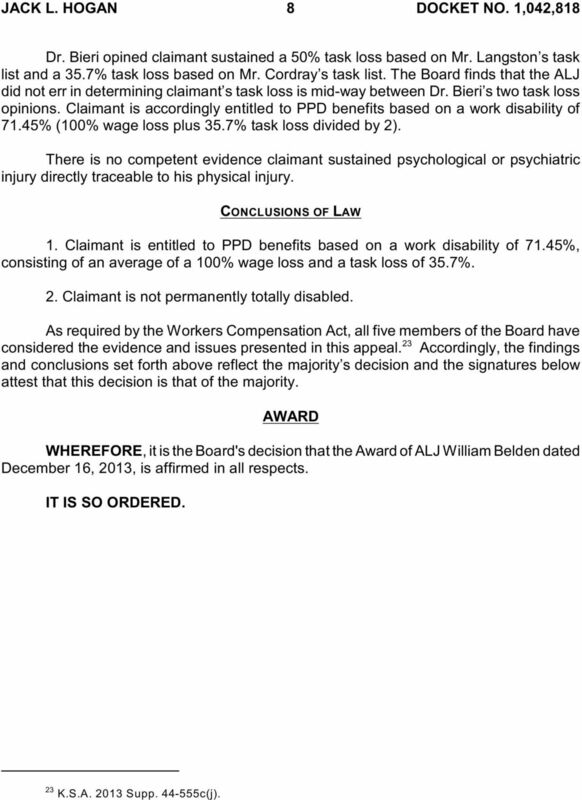 The ALJ averaged the task loss and wage loss and awarded permanent partial disability (PPD) benefits based on a 71.45% work disability. The ALJ also found claimant sustained a 10% permanent functional impairment to the whole body, a finding that is not disputed. 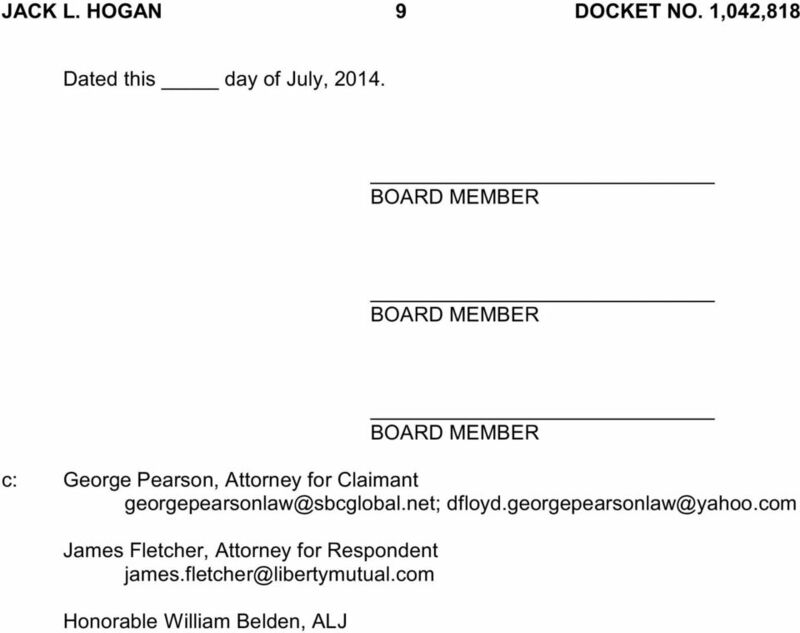 3 JACK L. HOGAN 3 DOCKET NO. 1,042,818 The following exchange occurred at Dr. Prostic s deposition: Q. 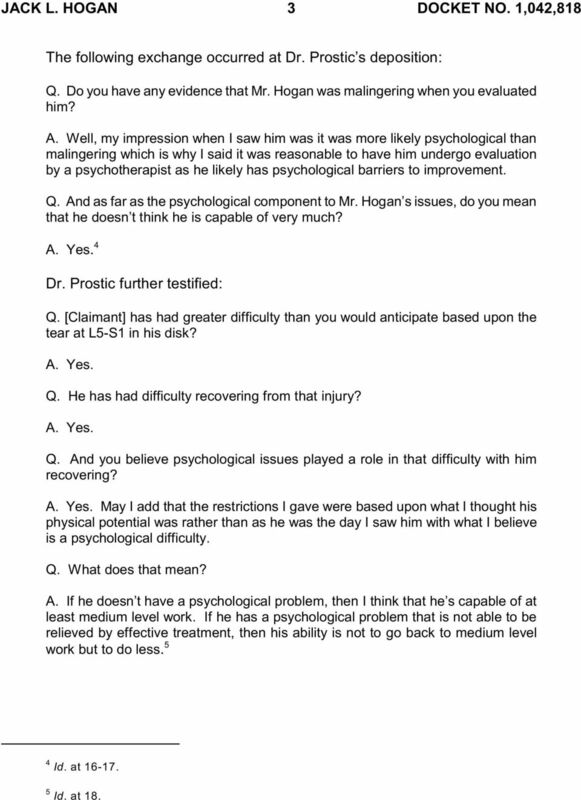 Do you have any evidence that Mr. Hogan was malingering when you evaluated him? A. Well, my impression when I saw him was it was more likely psychological than malingering which is why I said it was reasonable to have him undergo evaluation by a psychotherapist as he likely has psychological barriers to improvement. Q. And as far as the psychological component to Mr. Hogan s issues, do you mean that he doesn t think he is capable of very much? A. Yes. 4 Dr. Prostic further testified: Q. [Claimant] has had greater difficulty than you would anticipate based upon the tear at L5-S1 in his disk? A. Yes. Q. He has had difficulty recovering from that injury? A. Yes. Q. And you believe psychological issues played a role in that difficulty with him recovering? A. Yes. May I add that the restrictions I gave were based upon what I thought his physical potential was rather than as he was the day I saw him with what I believe is a psychological difficulty. Q. What does that mean? A. If he doesn t have a psychological problem, then I think that he s capable of at least medium level work. If he has a psychological problem that is not able to be relieved by effective treatment, then his ability is not to go back to medium level work but to do less Id. at Id. at 18. 4 JACK L. HOGAN 4 DOCKET NO. 1,042,818 Dr. Prostic testified claimant underwent a functional capacities evaluation (FCE) on August 21, 2008, which was judged by the author of the FCE report to be invalid because claimant was self-limiting his activities. 6 Dr. Prostic opined claimant should undergo the appropriate psychological testing to determine if he is psychologically disabled or is a faker. The doctor testified that if claimant had a psychological barrier, his restrictions would change from medium work to light duty work. Dr. Prostic claimed no qualifications as an expert in the fields of psychiatry or psychology. 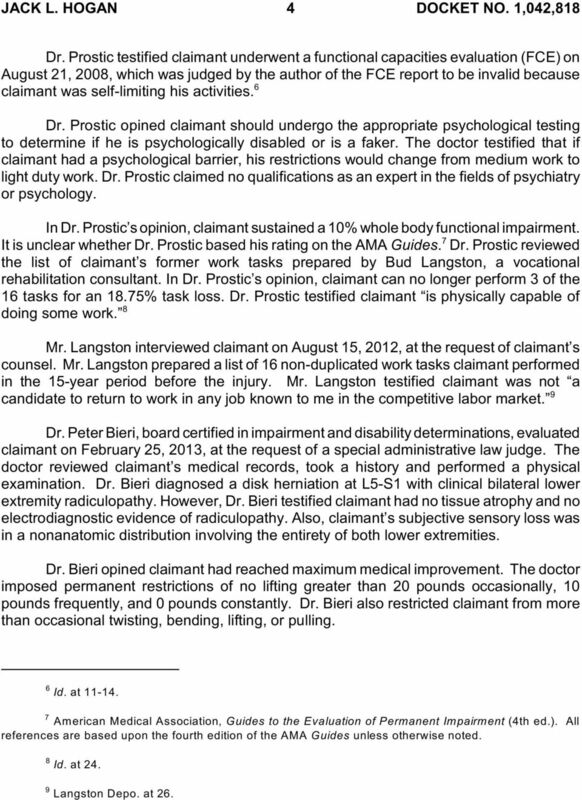 In Dr. Prostic s opinion, claimant sustained a 10% whole body functional impairment. 7 It is unclear whether Dr. Prostic based his rating on the AMA Guides. Dr. Prostic reviewed the list of claimant s former work tasks prepared by Bud Langston, a vocational rehabilitation consultant. In Dr. Prostic s opinion, claimant can no longer perform 3 of the 16 tasks for an 18.75% task loss. Dr. Prostic testified claimant is physically capable of doing some work. 8 Mr. Langston interviewed claimant on August 15, 2012, at the request of claimant s counsel. Mr. Langston prepared a list of 16 non-duplicated work tasks claimant performed in the 15-year period before the injury. Mr. Langston testified claimant was not a candidate to return to work in any job known to me in the competitive labor market. 9 Dr. Peter Bieri, board certified in impairment and disability determinations, evaluated claimant on February 25, 2013, at the request of a special administrative law judge. The doctor reviewed claimant s medical records, took a history and performed a physical examination. Dr. Bieri diagnosed a disk herniation at L5-S1 with clinical bilateral lower extremity radiculopathy. 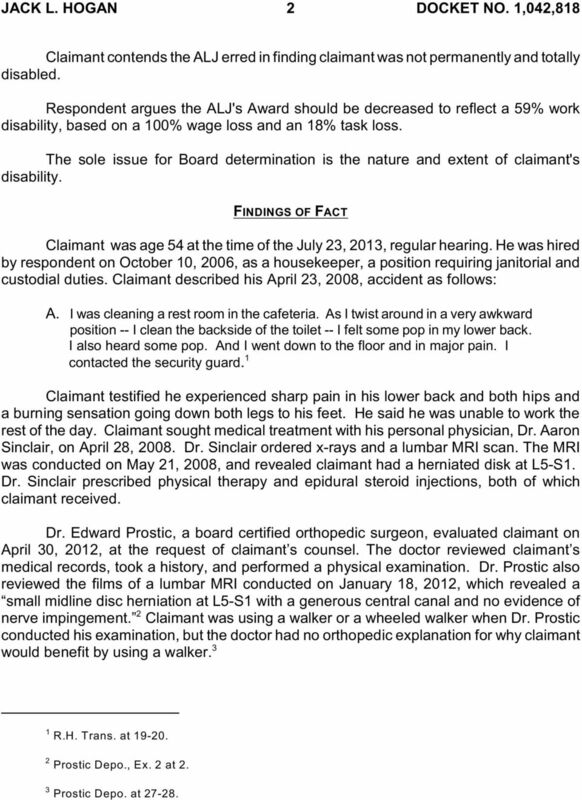 However, Dr. Bieri testified claimant had no tissue atrophy and no electrodiagnostic evidence of radiculopathy. Also, claimant s subjective sensory loss was in a nonanatomic distribution involving the entirety of both lower extremities. Dr. Bieri opined claimant had reached maximum medical improvement. The doctor imposed permanent restrictions of no lifting greater than 20 pounds occasionally, 10 pounds frequently, and 0 pounds constantly. Dr. Bieri also restricted claimant from more than occasional twisting, bending, lifting, or pulling. 6 Id. at Am erican Medical Association, Guides to the Evaluation of Permanent Impairment (4th ed.). All references are based upon the fourth edition of the AMA Guides unless otherwise noted. 8 9 Id. at 24. Langston Depo. at 26. 5 JACK L. HOGAN 5 DOCKET NO. 1,042,818 Based upon the AMA Guides, Dr. Bieri placed claimant in DRE Lumbosacral Category III and concluded claimant sustained a 10% whole body permanent functional impairment. Dr. Bieri reviewed the list of claimant s former work tasks prepared by Mr. Langston and concluded claimant could no longer perform 8 of the 16 tasks for a 50% task loss. 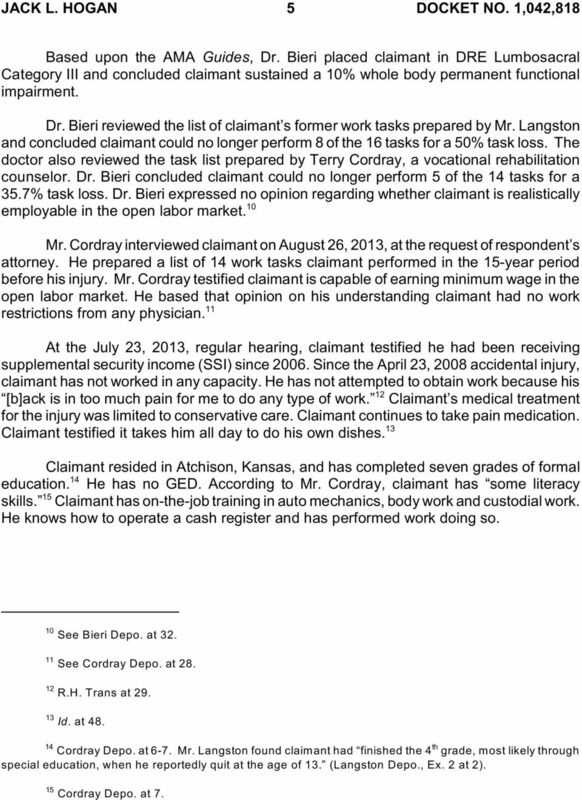 The doctor also reviewed the task list prepared by Terry Cordray, a vocational rehabilitation counselor. Dr. Bieri concluded claimant could no longer perform 5 of the 14 tasks for a 35.7% task loss. Dr. Bieri expressed no opinion regarding whether claimant is realistically employable in the open labor market. 10 Mr. Cordray interviewed claimant on August 26, 2013, at the request of respondent s attorney. He prepared a list of 14 work tasks claimant performed in the 15-year period before his injury. Mr. Cordray testified claimant is capable of earning minimum wage in the open labor market. He based that opinion on his understanding claimant had no work restrictions from any physician. 11 At the July 23, 2013, regular hearing, claimant testified he had been receiving supplemental security income (SSI) since Since the April 23, 2008 accidental injury, claimant has not worked in any capacity. He has not attempted to obtain work because his 12 [b]ack is in too much pain for me to do any type of work. Claimant s medical treatment for the injury was limited to conservative care. Claimant continues to take pain medication. Claimant testified it takes him all day to do his own dishes. 13 Claimant resided in Atchison, Kansas, and has completed seven grades of formal 14 education. He has no GED. According to Mr. Cordray, claimant has some literacy 15 skills. Claimant has on-the-job training in auto mechanics, body work and custodial work. He knows how to operate a cash register and has performed work doing so See Bieri Depo. at 32. See Cordray Depo. at 28. R.H. Trans at 29. Id. at th Cordray Depo. at 6-7. Mr. Langston found claim ant had finished the 4 grade, m ost likely through special education, when he reportedly quit at the age of 13. (Langston Depo., Ex. 2 at 2). 15 Cordray Depo. at 7. 6 JACK L. HOGAN 6 DOCKET NO. 1,042,818 PRINCIPLES OF LAW AND ANALYSIS In workers compensation litigation, it is the claimant s burden to prove his or her entitlement to benefits by a preponderance of the credible evidence. 16 Burden of proof means the burden of a party to persuade the trier of fact by a preponderance of the credible evidence that such party s position on an issue is more probably true than not true on the basis of the whole record. 17 The existence, nature and extent of the disability of an injured worker is a question 18 of fact. The finder of fact is free to consider all the evidence and decide for himself the 19 percent of disability the claimant suffers. The trier of fact is not bound by medical 20 evidence presented in the case and has a responsibility of making his own determination. Medical testimony is not essential to the establishment of the existence, nature and extent of an injured worker s disability. 21 K.S.A e(a) (Furse 2000) provides: Permanent partial general disability exists when the employee is disabled in a manner which is partial in character and permanent in quality and which is not covered by the schedule in K.S.A d and amendments thereto. The extent of permanent partial general disability shall be the extent, expressed as a percentage, to which the employee, in the opinion of the physician, has lost the ability to perform the work tasks that the employee performed in any substantial gainful employment during the fifteen-year period preceding the accident, averaged together with the difference between the average weekly wage the worker was earning at the time of the injury and the average weekly wage the worker is earning after the injury. In any event, the extent of permanent partial general disability shall not be less than the percentage of functional impairment. Functional impairment means the extent, expressed as a percentage, of the loss of a portion of the total physiological capabilities of the human body as established by competent medical evidence and based on the fourth edition of the American Medical Association 16 K.S.A Supp (a) and K.S.A Supp (g). 17 K.S.A Supp (g). 18 See Armstrong v. City of Wichita, 21 Kan. App. 2d 750, 907 P.2d 923 (1995), rev. denied 259 Kan. 927 (1996). (1987). 19 See Carter v. Koch Engineering, 12 Kan. App. 2d 74, 76, 735 P.2d 247, rev. denied 241 Kan See Tovar v. IBP, Inc., 15 Kan. App. 2d 782, 817 P.2d 212 rev. denied 249 Kan. 778 (1991). See Chinn v. Gay & Taylor, Inc., 219 Kan. 196, 547 P.2d 751 (1976). 7 JACK L. HOGAN 7 DOCKET NO. 1,042,818 Guides to the Evaluation of Permanent Impairment, if the impairment is contained therein. An employee shall not be entitled to receive permanent partial general disability compensation in excess of the percentage of functional impairment as long as the employee is engaging in any work for wages equal to 90% or more of the average gross weekly wage that the employee was earning at the time of the injury. The Board affirms the Award in all respects. K.S.A c(a)(2) provides that permanent total disability exists when an employee, on account of the injury, has been rendered completely and permanently incapable of engaging in any type of substantial and gainful employment. An injured worker is permanently and totally disabled when rendered essentially and realistically 22 unemployable. 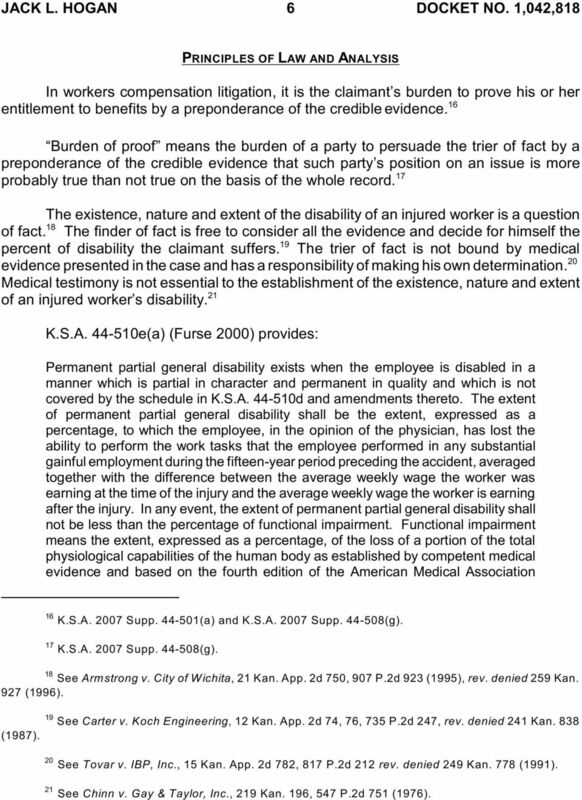 The preponderance of the credible evidence does not support the notion that claimant is permanently totally disabled. Claimant clearly believed he was incapable of any employment. However, it is difficult to place any significant weight on claimant s testimony regarding what work he is able to perform. The ALJ noted claimant s subjective reports about what he can and cannot do is not, by itself, credible evidence. The FCE was invalid because claimant limited his own activities. Claimant s complaints of symptoms in the entirety of both legs in a nonanatomic distribution lack credibility, as does claimant s testimony it takes him all day to do his dishes. There was no electrodiagnostic evidence supporting claimant s radicular complaints. The MRI scans show a small disk protrusion at L5-S1, but there is no neurological involvement. Drs. Prostic and Bieri agree claimant is capable of substantial gainful employment, as does vocational counselor Terry Cordray. 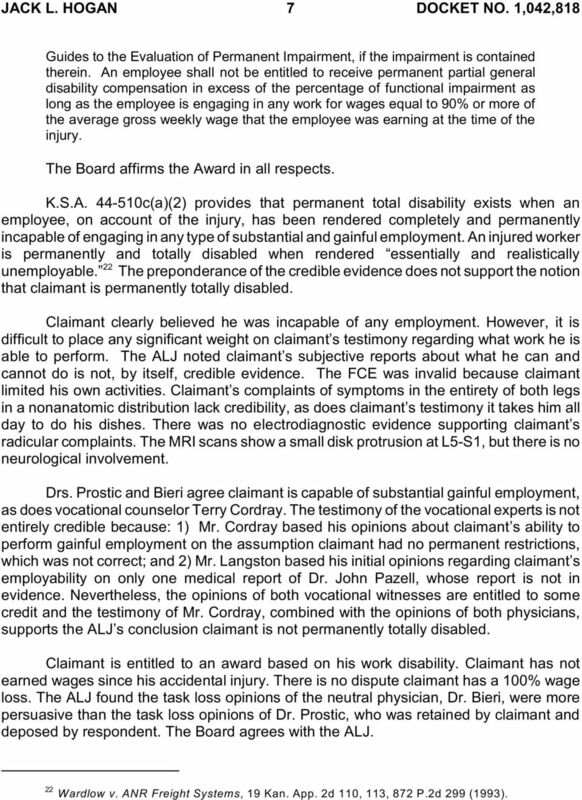 The testimony of the vocational experts is not entirely credible because: 1) Mr. Cordray based his opinions about claimant s ability to perform gainful employment on the assumption claimant had no permanent restrictions, which was not correct; and 2) Mr. Langston based his initial opinions regarding claimant s employability on only one medical report of Dr. John Pazell, whose report is not in evidence. Nevertheless, the opinions of both vocational witnesses are entitled to some credit and the testimony of Mr. Cordray, combined with the opinions of both physicians, supports the ALJ s conclusion claimant is not permanently totally disabled. Claimant is entitled to an award based on his work disability. Claimant has not earned wages since his accidental injury. There is no dispute claimant has a 100% wage loss. The ALJ found the task loss opinions of the neutral physician, Dr. Bieri, were more persuasive than the task loss opinions of Dr. Prostic, who was retained by claimant and deposed by respondent. The Board agrees with the ALJ. 22 Wardlow v. ANR Freight Systems, 19 Kan. App. 2d 110, 113, 872 P.2d 299 (1993). 8 JACK L. HOGAN 8 DOCKET NO. 1,042,818 Dr. Bieri opined claimant sustained a 50% task loss based on Mr. Langston s task list and a 35.7% task loss based on Mr. Cordray s task list. The Board finds that the ALJ did not err in determining claimant s task loss is mid-way between Dr. Bieri s two task loss opinions. Claimant is accordingly entitled to PPD benefits based on a work disability of 71.45% (100% wage loss plus 35.7% task loss divided by 2). There is no competent evidence claimant sustained psychological or psychiatric injury directly traceable to his physical injury. CONCLUSIONS OF LAW 1. Claimant is entitled to PPD benefits based on a work disability of 71.45%, consisting of an average of a 100% wage loss and a task loss of 35.7%. 2. Claimant is not permanently totally disabled. As required by the Workers Compensation Act, all five members of the Board have 23 considered the evidence and issues presented in this appeal. Accordingly, the findings and conclusions set forth above reflect the majority s decision and the signatures below attest that this decision is that of the majority. AWARD WHEREFORE, it is the Board's decision that the Award of ALJ William Belden dated December 16, 2013, is affirmed in all respects. IT IS SO ORDERED. 23 K.S.A Supp c(j). No. 102,236 IN THE COURT OF APPEALS OF THE STATE OF KANSAS JONATHAN Z. TYLER, Appellant, v. GOODYEAR TIRE & RUBBER COMPANY and LIBERTY MUTUAL INSURANCE COMPANY, Appellees. SYLLABUS BY THE COURT K.S.A. STATE BOARD OF WORKERS' COMPENSATION Heritage Tower, Suite 200, 18 9th Street Columbus, Georgia 31901 (706) 649-7372 www.sbwc.georgia. BEFORE THE APPEALS BOARD FOR THE KANSAS DIVISION OF WORKERS COMPENSATION DENNIS HARLAN ) Claimant ) ) VS. ) ) USF HOLLAND, INC. ) Respondent ) Docket No. 1,054,886 ) AND ) ) OLD REPUBLIC INSURANCE CO.
BEFORE THE ARKANSAS WORKERS' COMPENSATION COMMISSION CLAIM NO. G304790 JANE E. JAMES, EMPLOYEE CLAIMANT TYSON POULTRY, INC.
STATE BOARD OF WORKERS' COMPENSATION Suite 600, 270 Peachtree Street, NW Atlanta, Georgia 30303-1299 www.sbwc.georgia. BEFORE THE ARKANSAS WORKERS COMPENSATION COMMISSION WCC NO. G102391 CURTIS GRAHAM, EMPLOYEE GET RID OF IT OF ARKANSAS, INC.
JEFFREY P. GUERRIERO, PLAINTIFF, 1998 OPINION #301 S T A T E O F M I C H I G A N WORKERS COMPENSATION APPELLATE COMMISSION V DOCKET #96-0235 CENTURY MACHINE INC AND SAFECO INSURANCE COMPANY, DEFENDANTS.